Just before leaving to North Sulawesi and in the process of packing I realised I had not completed the tweak of my GoPro Hero2 Set up. I do not use the GoPro for video but for time lapse however the modification that I will present here is valid for both video and stills or time lapse. Some users of the PolarPro filter have noticed that when you point the camera to the sunball or on a very bright day there is quite a bit of flare with this filter in the image corners. Flare occurs when stray light enters the frame and reduces contrast giving a result a picture with washed out colours. Flare is more relevant to wide angle and is usually reduced with lens hoods however our GoPro does not have anything like that and due to the large field of view probably it is better to be so otherwise the hood would be visible. So what can we do to improve our polarpro filter and why does it flare more than others in the first place? The PolarPro is the lowest price push up filter for the gopro and the reason is that its build is very simple. All other filters will have a dark rubber ring on the edge that has the dual effect to secure the filter to the housing and eliminate the stray light that may enter from the side. 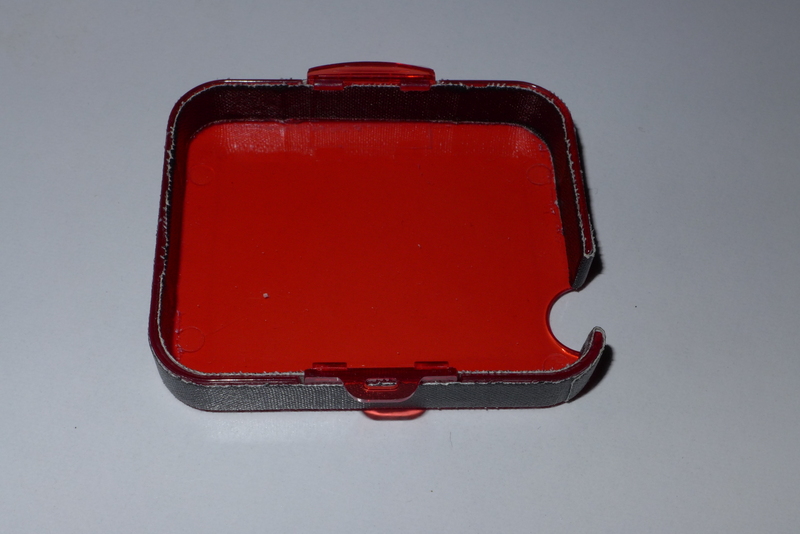 The polarpro is one single piece of acrylic and does not have this ring around the lens. So let’s build one cheaply all you need is genuine gaffer tape, to make it look better I suggest black matt gaffer. Pull enough length to cover the whole external ring of the polar pro filter and lay it on it to go from the edge of the front side back to the where the lateral panel ends. Once you have measured the approximate length make note of the width and then remove the gaffer. Pull the tape so that it rips at the width required and then tape the exterior making sure the smooth part is on the front side. Then create another strip a bit longer for the inner part. Make sure it is going straight and with no bubble and then once you get to the opening for the button come outside and overlap the exterior ring. Gaffer type does not mark and will stay there for a good number of dives. I am going to test this and see how long it goes but I expect more than 20 dives before it falls apart. You can see in the featured image how the retail package presents, it is pretty simple inside we find the filter itself, a tether and a little bag to store the filter that also serves the purpose of cleaning it. This is the cheapest removable filter for Gopro at a price of $29.99 and it is also available in Magenta version, that for reason explained in the previous post I recommend to skip entirely. The declared working depth is 10 to 70 feet or 3-21 meters. For what we have seen in the previous post this is somewhat optimistic and will be true only in ideal conditions of blue sky and 100 feet visibility in clear blue water, in different conditions the maximum depth will be less. 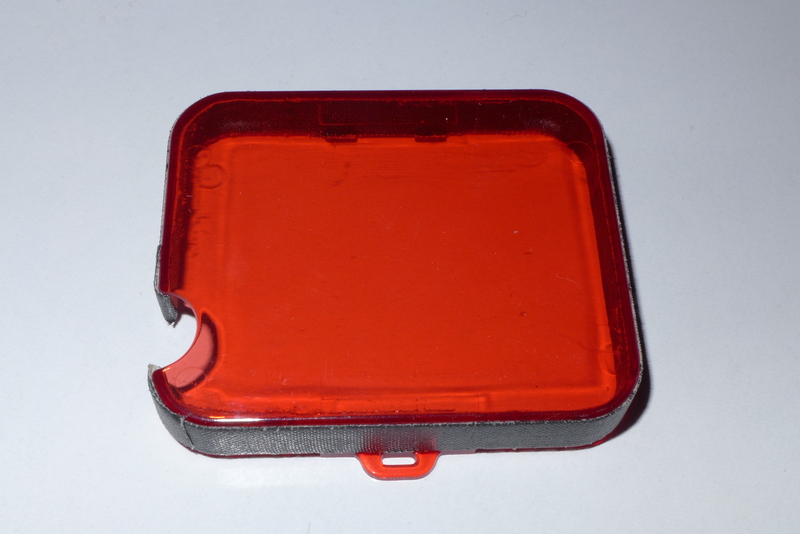 The filter is made of Optical acrylic and there are no defects on it, it is fairly light and snap comfortably on and off the GoPro dive housing. 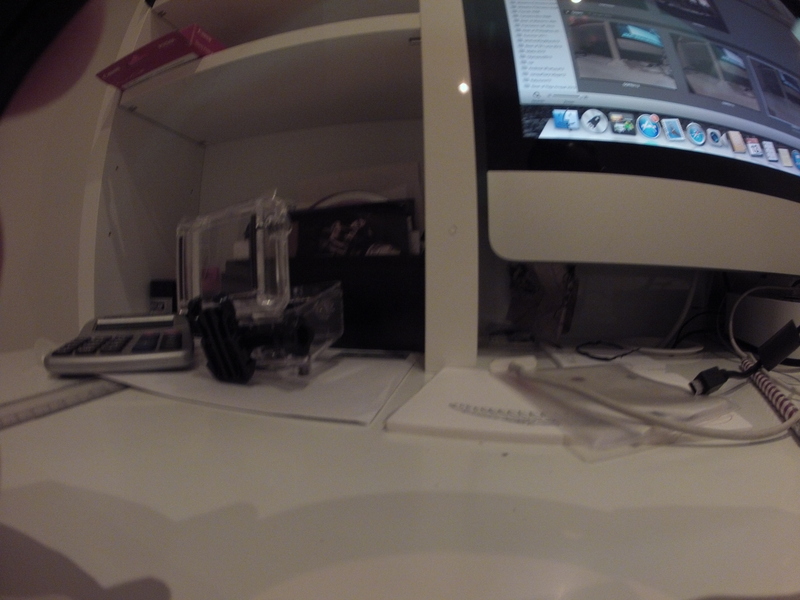 As we can see the polar pro red filter actually casts a light magenta tint on the gopro image. So as a Hero2 user would I spend $29.99 for Polar Pro or $83.00 for the SRP dome the only true removable filters? Or should we say what do I get for additional $53? So the UR/PRO is warmer than the Polar Pro and has got little tint to it. It may be useful to compare using a camera with custom white balance how the histograms look if we fix the white point and then apply the filters. The image is globally warmer and has no obvious tint. 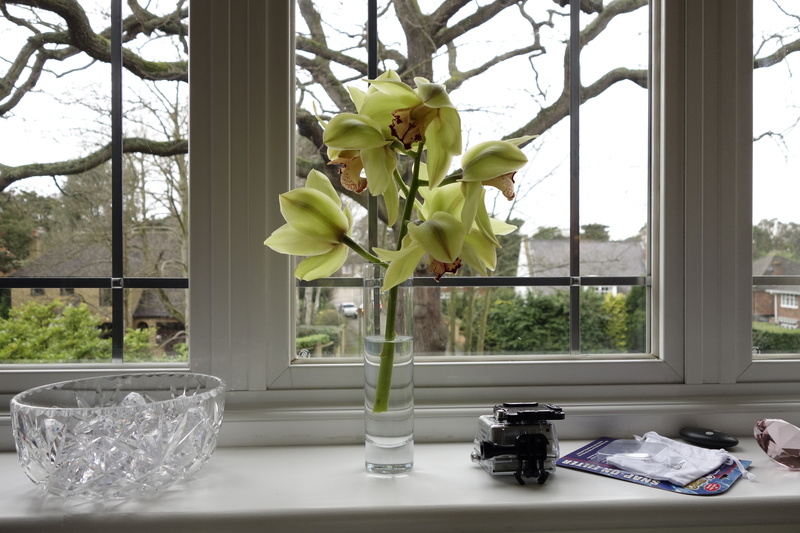 Both the UR/PRO and PolarPro settle at identical exposure ISO400, f/2.5 1/50 of a sec with a 1 and 1/3 f-stop loss from the camera without filter that has a f/4 aperture. So what does this mean? The UR/PRO behaves like a camera CTO filter most likely a CTO 1+1/2 if not double shifting the color temperature down in a similar fashion for the whole spectrum as it does not have a tint. 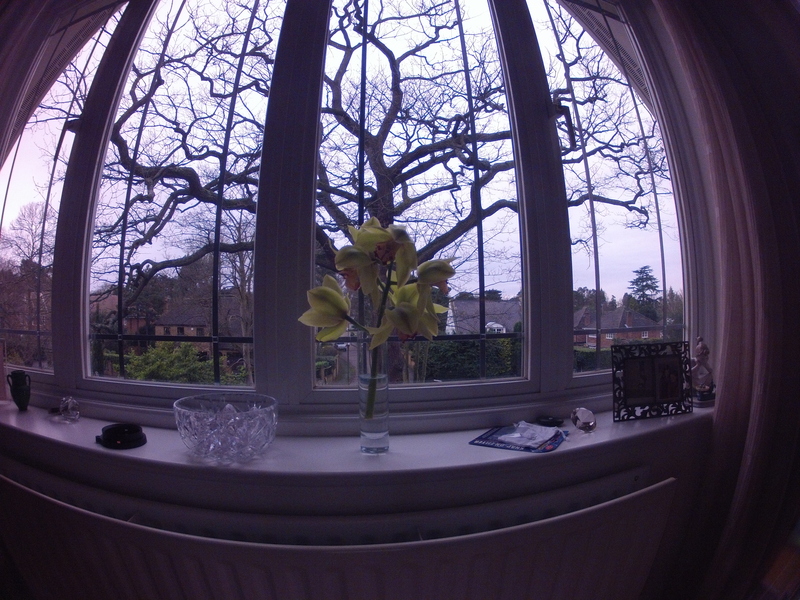 The PolarPro does the same with a less warm bottom end and a clear magenta tint that acts as a green filter. The magenta also creates spikes in the green and blur that are characteristic of a selective filter. So which one is better? Overall the UR/PRO can’t be faulted as it does not introduce any tint and is warmer will most likely work in blue water at greater depths, how much greater is impossible to say. The UR/PRO is also very well balanced the proof is in the Gopro photo in auto there is no hue of any type which means this filter can be put in the camera at fairly shallow depths and still perform well. 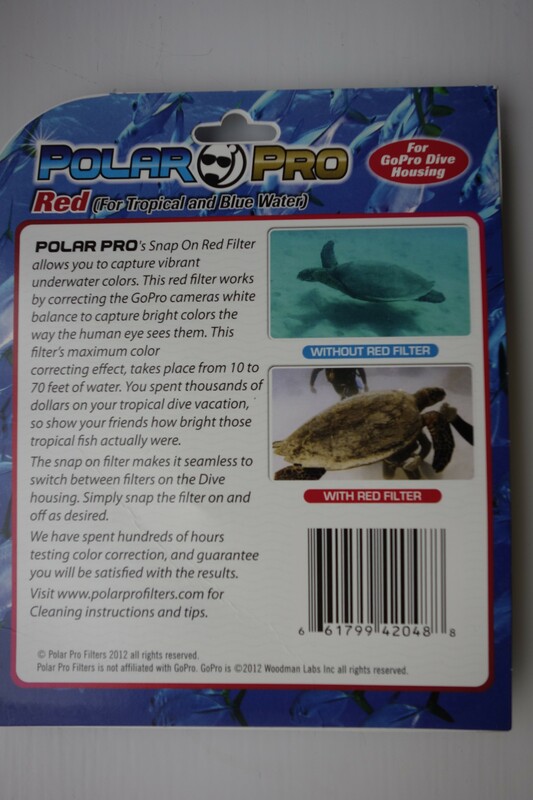 The PolarPro seems to be a combination of a CTO filter plus a minus quarter or half green, this filter will be less effective at depth but work well both as red filter in blue water and because of the tint also in greenish water. It will however generate unnatural tint in blue water. The ergonomics of the PolarPro are great the light piece of plastic is essential a design copy of the GoPro flat port cap the button is accessible and you can see the display if you need to. For $29.99 you can’t ask for more especially as it does well in water that is greener too. I can imagine it will require some tint correction in post in really blue water but this I have only seen in the Bahamas or Turks and Caicos anywhere else the green tinge was there and this cheap filter will take care of it. Also the Auto WB of the GoPro seem to love green so this will really do well in most occasions and I look forward to test it in fresh water where so far I have not used any filter. Now that we know how the filter is done and what it can do how do we justify this? The combination of those factors could explain the difference in performance in this test. Now coming to the Hero3 what about SRP Blurfix 3 versus PolarPro considering the filter themselves are the same? A hefty $80 difference for a piece of equipment the Hero3 that costs $399 is this justified? If we take out the Polarizer and consider the SRP dome for Hero3 at $77 the difference is still $47. I would say it depends, for the average user that has an Hero2 or Hero3 and uses it at normal depths and is not after the maximum quality the PolarPro is just fine affordable and keep the overall cost down, it can also be removed and the ergonomics are great. If instead you want to use the filter at greater depths and especially in water that are really blue the URPRO cannot be beaten however the price differential is substantial. Now some people will say hang on a minute filters have to be tested in water etc etc. Well that is not definitive either because filters perform differently in different conditions, different locations so there is not an absolute best ever this is why cameras have custom white balance. Filters are not rocket science there is a lot that can be foreseen just by looking at histograms and temperature and we can set our expectations quite easily. If you are in the market for a removable GoPro filter at $29.99 the PolarPro Red filter is a killer as it works well in green water too. If instead you are not after a removable filter just get yourself a sheet of Lee double CTO and a pair of scissors and cut it to go inside the housing, this will cost 50 cents and be perfectly fine. If you are a perfectionist and want to push your gopro to the maximum working depth of a filter and want a removable option the SRP UR/PRO is for you. Following a number of posts about filters in various GoPro forums I decided to check in detail the behavior of the UR/PRO filters and see what is that they really do. I guess the reason is that people do not really know or want to know the physics behind it and prefer to entertain many discussion that involve trial and error. One of the most interesting one is this clip here that generated some ferocious comments by some users of other products that of course were not pleased having spent money that their choice seemed not to be the best. To understand a bit more about what filters do we need to look at light temperature graphs like the one below. Light colour is measured in K and high value means cold blue light and low values represent warm red light. As we know underwater red gets absorbed approximately at a rate of 1 f-stop every 2.5 meters we go deeper compared to blue light with the result that red colour disappears pretty quick followed by green to become completely blue at depth. Some time ago cameras were shooting film not digital and there was no way to correct colours when the film itself got developed. So to perform some decent underwater photography people used strobes and fisheye lenses to get really near and blast the reef with light in order to restore the real colors. This worked very well for close shots but was useless for wide angle at distance, so color correcting filters that could go underwater were developed for ambient light photography. So what is a CC filter? A common misconception is that filters add colours to the picture, whilst this is practically true this is technically incorrect. So what does a CC filter really do? As the word says it filters light, more specifically filters selected part of the color spectrum. This is done at expense of available light so if we use a filter we will have less total light or for our purposes exposure. This is well explained on the URPRO website where they talk about film sensitivity, if you use a filter you will loose 1 f-stop so use a higher ISO film. The filter can be designed for different purposes and depending on its color and opacity will be more or less aggressive. If you read very carefully the urpro website says that there is a maximum distance that the filter will be effective at. Photographically and visually reds, oranges and other warm colors become dominated by the natural blue-green (cyan) effects of the water when it is more than 8-10 feet deep. Because all water is a continuous filter, the deeper a subsea photographer goes beneath the surface, the more colors are naturally “filtered out” of the spectrum. Scuba divers using a still camera or a movie camera must combine the depth of the water plus the distance of the camera from the subject. This sum should not exceed 80 feet for color negative films and video, and should not exceed 30 feet for color slides. In all cases, the best color is achieved when the camera is close to the subject! What that means is that the working distance of the distance is not the same as depth so you can push a filter say down to 24 meters but then the distance to subject needs to be zero. So if you are shooting something 3 meters or 10 feet away in 21 meters of 70 feet that as much as you can get. When it comes to underwater use we are mostly interested in eliminating blue in tropical waters or green in cold algae waters. In order to eliminate blue that has a high colour temperature we need warm colors typically something around orange. This will some of the blue beams and also part of the green beams and will produce filter light that is of a warmer color and will look ‘more red’. But how much does for example a URPRO orange filter for blue water really warm up the light? I have done some empirical tests with my Sony RX100 in a day where the Sony would measure a temperature of 6500K which pretty much correspond to cloudy day indoor. 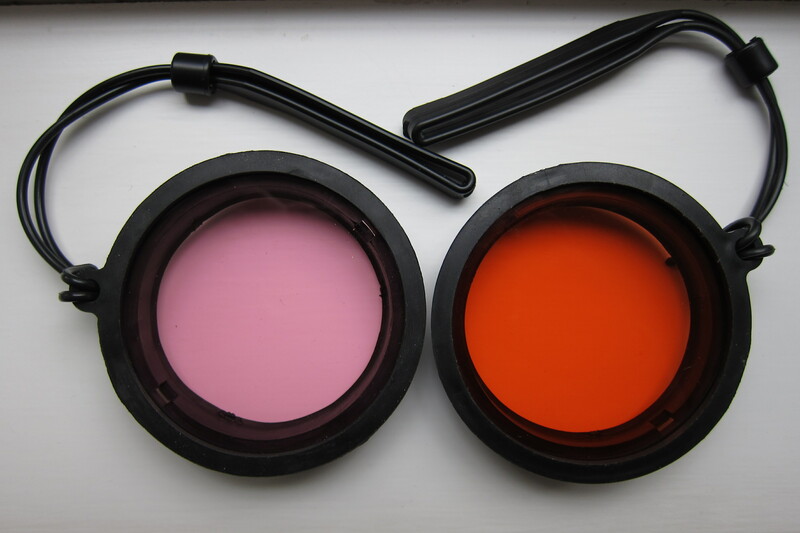 The URPRO orange filter which is the same that is on the SRP filter for GOPRO measured 2800K with a tint of 5 Magenta. It also measured an overall absorption of 1 and 1/3 fstop of total light. I measure this filter instead of the one I have (which is not SRP and we can cover why in another place) because I think the SRP is the market lead at this time and it uses UR/PRO filters. So the reason why the picture stops having any red and starts looking green is that there is no red left in the light! The breaking point seems to be around 18-21 meters or 60-70 feet and corresponds to our personal experiences I would say. So what about custom white balance? We are pretty much in the same situation we can re-balance the camera up to 10,000K and add magenta or orange tint to the picture but you reach a point where there is too much red color noise. The other advantage of custom white balance is that there is no light absorption so the picture ends up being less noisy as at the same aperture a loss of 1 and 1/3 fstop is like saying doubling the ISO from 800 to 1600 to capture the same scene. This is the reason a camera with custom white balance will always outperform the same camera with a filter at depth in terms of picture noise. And what about Magenta filters? This is an interesting one as magenta filter absorb little light around 1/3 of fstops for URPRO and warm up the colour very little around 700-800K with a magenta tinge more prominent. 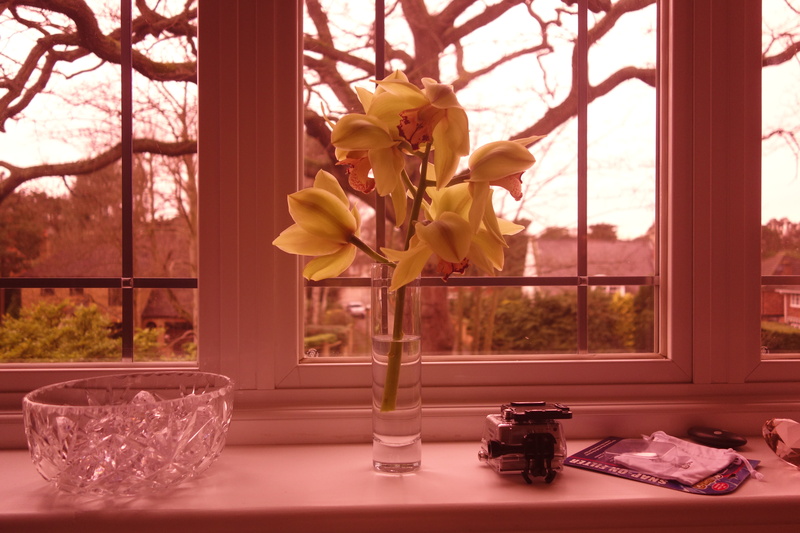 A magenta filter will therefore absorb less light in total and introduce just a tint to the image. From my tests a magenta filter is totally worthless on a camera that can white balance and frankly not that good at depth on camera with auto mode only. The reason is that light will get cold very soon at depth and the camera will be outside the AUTO white balance operating range (2700-7000 on average) pretty soon. Although I have not yet measured I would think probably max 10 meters and that is it as I had similar results with my Sanyo that has same sensor size of the gopro and actually a faster lens. Hope gopro users find this post useful as well as other users of compact camera to shoot video in ambient light. In the next post I will compare the optical quality of the SRP dome port with the PolarPro snap on filter that generated such a debate on youtube and we will see why this filter could perform better than the SRP dome.